Frontotemporal degeneration is an umbrella term for a group of disorders that primarily affect the frontal and temporal lobes of the brain — The disease destroys the ability to behave appropriately, empathize with others, learn, reason, make judgments, communicate and carry out daily activities. 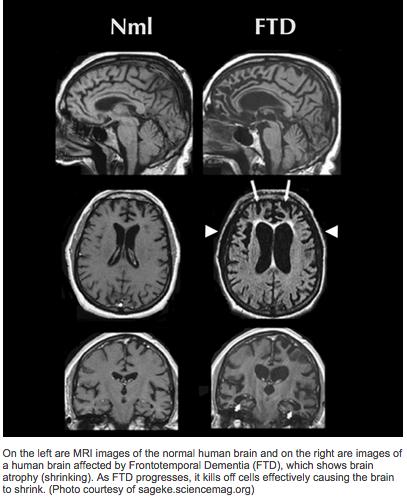 Frontotemporal degeneration causes portions of the lobes atrophy or shrink (see image on right). 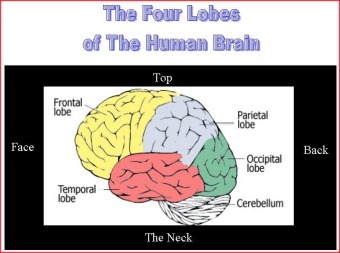 Signs and symptoms depend on the part of the brain affected. Some people experience drastic changes in their personality, becoming socially inappropriate, impulsive or indifferent (behavioral variant frontotemporal dementia (bvFTD)), while others lose the ability to use language (Primary progressive aphasia (PPA)). Frontotemporal dementia is often misdiagnosed as a psychiatric problem or Alzheimer's disease. But frontotemporal dementia tends to occur at a younger age than does Alzheimer's disease, generally between the ages of 40 and 75. FTD was once considered rare, but it's now thought to account for up to 10 to 15 percent of all dementia cases. FTD affects an estimated 50,000-60,000 Americans. In those younger than age 65, FTD may account for up to 20 to 50 percent of dementia cases. FTD currently has no preventitive medicine and no cure.